Humans have made history in space once again, and this time it didn't even involve sending humans there. On Wednesday, the European Space Agency's (ESA) Rosetta Mission landed a craft on a comet for the first time in history. The Rosetta Mission's Philae lander, a robotic probe, touched down on the 67P/Churyumov-Gerasimenko comet on Wednesday morning, opening the door to significant new discoveries in what comets are and how they behave. All the expected insight is exciting, sure, but just looking at the breathtaking pictures — which are the first-ever taken from the surface of a comet — make the entire mission seem worthwhile already. According to the ESA's website, the Rosetta mission targeted several milestones, including becoming the first spacecraft to orbit a comet’s nucleus, the first spacecraft to examine from up close how a frozen comet reacts to the warmth of the Sun, the first orbiter to dispatch a lander onto the surface, and the first mission to obtain images from a comet's surface while making the first in situ analysis of the surface. Named after the Rosetta Stone, which helped the Europeans discover the ancient Egyptian civilization, the Rosetta mission will help unravel the secrets of comets, which go back far beyond ancient Egypt to 4,600 million years ago, when they surrounded the Sun in place of any planets. 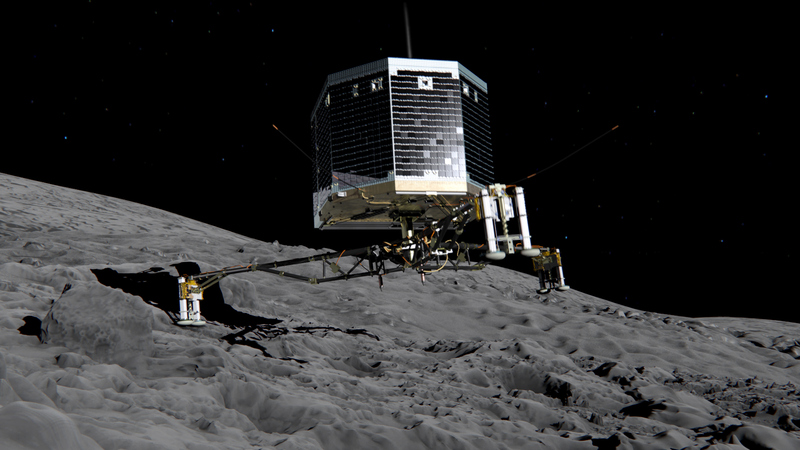 When Philae made contact on Wednesday, the mission control station at ESA erupted in applause. After receiving snaps from Philae of the comet and the view of space from the surface, ESA promptly tweeted them to awe the world. Take a look.The glorious moment the scientists have been waiting for since launching the mission on March 2, 2004. Here's what the Rosetta spacecraft looks like. Here are some shots of Philae separating from its mother ship. And here's a shot of the probe on its way to the comet. Some of the shots look like they're out of a sci-fi movie. This shot of the 67P comet from just 3 km away is unreal. And here are some breathtaking pictures of the comet itself.